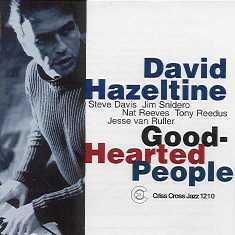 On Good-Hearted People , his second quintet session for Criss Cross, David Hazeltine takes on the challenge of writing for the contrasting textures of the trombone-alto saxophone front line, -- Steve Davis and Jim Snidero -- a pairing virtually without precedent in the jazz canon. Propelled by bassist Nat Reeves and drummer Tony Reedus, the date swings madly, while Hazeltine contributes the beautiful color-voicings and lucid, cool-fire improvisating we've become accustomed to. As a guest on two tracks the great Dutch guitarist and Thelonious Monk Competition winner Jesse Van Ruller.